LO3 was one of the three original Land Rover prototype vehicles and will be shown at 'Land Rover Legends' later this month. The show will take place over the weekend of 26/27 May at Bicester Heritage which was once a WW2 RAF bomber station. On the 27th April 1948, L03 was ‘despatched out’ of Seagrave Road by Mr. Bacon (Manager of Rover Company’s London depot at Seagrave Road in Fulham) and driven to Amsterdam by his young son Ernie to join the Rover Company showcase, launching what was to become one of the most iconic automotive brands in the world. 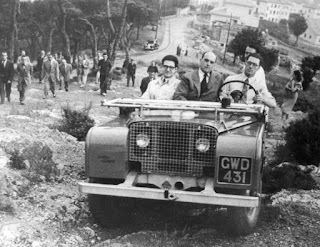 Later in May that year, L03 was registered to the Rover Company Ltd in Solihull as a demonstrator, and in June was despatched to Vallvidrera Hills in Barcelona for the global press launch of the Land Rover. It also made an appearance at the 1948 Barcelona International Trade Fair, before returning to the UK, being converted to right hand drive and then used by Rover Company Director, R L Wilks – nephew of Maurice Wilks – Land Rover’s founding father. Through the 1950s and 60s L03 changed hands a couple of times before being bought in 1974 by the current owner. Lovingly maintained and restored, the vehicle has participated in every major Land Rover milestone since – with a number of television appearances under its belt over the decades.